Today is another cool and rainy day in Oslo, befitting the somber mood. We see on the news circulating around the world that 77 persons have lost their lives in a dual home-grown terrorist attack. First, a bomb exploded Friday afternoon in the government quarter for Norway in the city center of Oslo, killing eight; a mere two hours later 69 persons, most of them teenagers, were fatally injured from gunfire on Utøya [Out island], a small island in Tyrifjord 37 km (23 miles) west northwest of Oslo. Many more were gravely injured. Some tried to swim to safety from the island, only to be shot in the back as they did. The event had gathered about 650 people in a summer political camp run for many years by the Workers’ Party, the current ruling party in Norway. An ethnic Norwegian of white supremacist stripe has been arrested and charged in both tragedies. He has admitted to perpetrating the atrocities in both venues, but according to his court-appointed lawyer, intends to plead ‘not gulity’ in court tomorrow. Before the attacks he published on the Internet his ‘Manifesto’ of 1500 pages declaring civil war in Europe against the Muslim population. Whether or not the plot involves others is not known. My wife Bente is Norwegian; I, as most of you know, am an American. Together we sat incredulous before the events unfolding. Stateminister Jens Staltenberg has spoken and been interviewed many times, King Harald V, as well, from secret locations, as he was being protected by the King’s Guard. This is all sad news in this free democratic country so respected for peace efforts around the world, with Oslo, of course, the home of the Nobel Peace Prize. All agree that Norway is changed forever. In a stroke of heroic statesmanship, in the face of losing many trusted friends and allies, Prime Minister Staltenberg affirmed that Norwegians will respond with more democracy, more freedom. Regrettably, in my personal thought, my own country responded to terror with less of both. But that is another thought, for another day. As all are saying today again, we offer our thoughts and prayers to those so cruelly affected, including all Norwegians, and all Americans, especially this one in his adopted home. 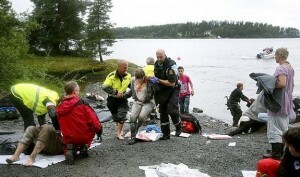 This entry was posted in Blog, Norway terror attacks on 24.07.2011 by Paul Carlisle Kettler.